Seoul November 25, 2004; Kim Tae-gyu writing for the Korea Times reported that a self-regulated bi-pedal robot will be presented to the public later this year, developed by a team of scientists from the Korea Advanced Institute of Science and Technology (KAIST). KAIST professor Oh Jun-ho, who led the humanoid research, yesterday said his team would unveil the two-legged robot, named KHR-3, in December. ``The robot can walk like a human longer than an hour powered by embedded batteries. We plan to release the self-contained robot's specifications next month,'' he said. Oh, Korea's pioneer in humanoid development, has already developed a pair of bi-pedal walkers called KHR-1 and KHR-2, although he did not officially unveil them. The KHR-1 was completed midway through last year as a prototype model without a head and hands. Its successor _ KHR-2 _ came early this year, looking more humanlike and has been occasionally exposed to the public. ``When compared to KHR-2, the KHR-3 has a sleek design which can wow people and sports streamlined functions aimed to enhance walking ability,'' Oh said. 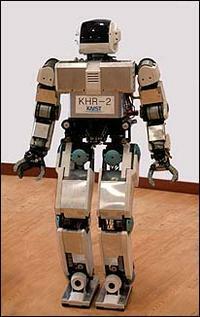 The 1.2-meter-tall KHR-3 is similar in size with Japan's Asimo, a top-of-the-line walking robot made by Honda, and weighs roughly 55 kilograms. Oh Sang-rok, a project manager from the Ministry of Information and Communication (MIC), confirmed Jun-ho's remarks regarding the KHR-3. ``First of all, we have tried giving the KHR-3 a facelift to grab people's attention. We have also improved its locomotion by upgrading its hip joints, for example,'' he said. Sang-rok added the KHR-3 can walk by using 41 built-in motors and numerous joints and can also shake hands or lift objects with its five-fingered hands. With the advent of the KHR-3, Korea will be able to narrow the gap with Japan in the competition to make two-legged robots. Led by Honda's decade-long robotics research, Japan has flat-out dominated the bi-pedal technology up until now and Honda's Asimo amply demonstrates the nation's cutting-edge work. Asimo, which was displayed to the public in 2000, is arguably the world's most advanced two-legged robot since it can walk smoothly and turn sharply without stopping. It is also able to climb stairs and understand voices. Honda is further upgrading the sophisticated model and plans to reveal the new version early next year. However, Jun-ho said the technological gap in robotics between Korea and Japan is not so astronomical that it cannot be overcome. ``The capability of moving up stairs can be learned by our KHR-3 through experience. Although our research is still in the embryonic stage, software-based functions such as voice recognition is also not a big deal,'' the 50-year professor said. He declined to specify the size of the gap, but MIC project manager Oh Sang-rok provided an explanation. ``In order to understand the humanoid development, we must split two facets of the mechanics and intelligence. Mechanically, we lag behind Japan 2-3 years, but we are almost on par with the country in intelligence,'' the project manager said. In consideration of decades-long research experience of Japanese robotics engineers and Korea's relatively short development history, Oh Sang-rok said Korea has a shot at emerging soon as a major player. ``Japan's Waseda University started studies on the bi-pedal locomotion in the early 1970s and Honda also embarked on work to develop an advanced humanoid robot in 1986. By contrast, KAIST began similar research in 2000 and has come this far,'' he said. Although separately interviewed by telephone, the two Ohs see upside potential of the two-legged machine in the nation's bold scheme of deploying network-based robots. The MIC looks to kick off feasibility tests of five different network-based robots _ three for home usage and two for post offices _ late next year. The project, codenamed ubiquitous robotic companion (URC), is led by MIC project manager Oh in a bid to remain competitive in the global humanoid race. Sophisticated robots need three fundamental functions of sensing, processing and action, according to Sang-rok. Instead of cramming the three into a single machine, Sang-rok's team came out with the paradigm shift of outsourcing most sensing and processing abilities by connecting to the broadband network. ``Think of downloading a variety of software to your computer via high-speed Internet network. Like that, you will be able to download sensing and processing powers from the network, which will reduce the price of robots,'' he said. The five first-phase URC dummies move on wheels as bi-pedal walking technology is still in its infancy to be used as a mechanical servant at home or office. However, Oh Jun-ho expects the bi-pedal walker will eventually be a mainstream model for the networked robot project and his team is working to produce a platform for the future. ``In the early stages, we will use wheeled models in light of its higher commercial viability. But in the long run, we will be likely to adopt more and more bi-pedal models,'' Sang-rok said, agreeing with Oh Jun-ho.